I've officially started training for the 2009 Danskin SheRox Tri. I say officially because I've now hired a swimming trainer to help me improve my swimming skills and to learn more efficient swim strokes and techniques. 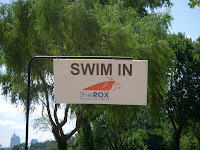 I don't want to panic and doggie paddle the 1/2 mile swim portion of my triathlon this coming August 2nd. I had my first lesson on Friday afternoon, and I put to use the tips the trainer gave me when I swam on Saturday afternoon. I have not been swimming since September but I continued to do my other work outs; weight training, running, biking when the weather permitted, and taking yoga classes. The workouts have paid off greatly, my upper body strength is strong and I felt confident in the pool this past week. Once I get my breathing into a steady rhythm, I think I can swim the Schyulkill without resorting to slowly paddling along while two or three other waves of swimmers move quickly past me. I'm not sure why I stopped swimming once the Fall arrived. I used the excuse that I didn't want to catch a cold or get too wet only to go out into the cold night air. I guess I figured there was always time to get back to the pool. Truth be told, I love to swim. It's fun, as relaxing as meditation and the improvement it gives to your body are amazing. Swimming is the ultimate low-impact work out that quickly yields great aerobic and full body toning results. I'm really looking forward to my other lessons so I can build my endurance and perfect the crawl stroke. It's so funny to me that when I was in the Schyulkill River last year, that all I could think was, "NEVER AGAIN" and now I can't wait to plunge back in and take on that murky water challenge. Having survived that portion of the triathlon and having the knowledge of what to expect, I'm not only not afraid, but I feel like even at this early stage, I'm sort of prepared. The best thing about having started swimming again is that I now know that my physical capabilities are so much further along today then they were last year at this time. I'm not starting from the beginning but rather from some mid-way point. I can see where I was and where I need to go from here. What a great vantage point for perspective.